Growth is probably the biggest issue in the 2014 county races. Opponents of the Young Board complain that too much growth is occurring in Frederick County. 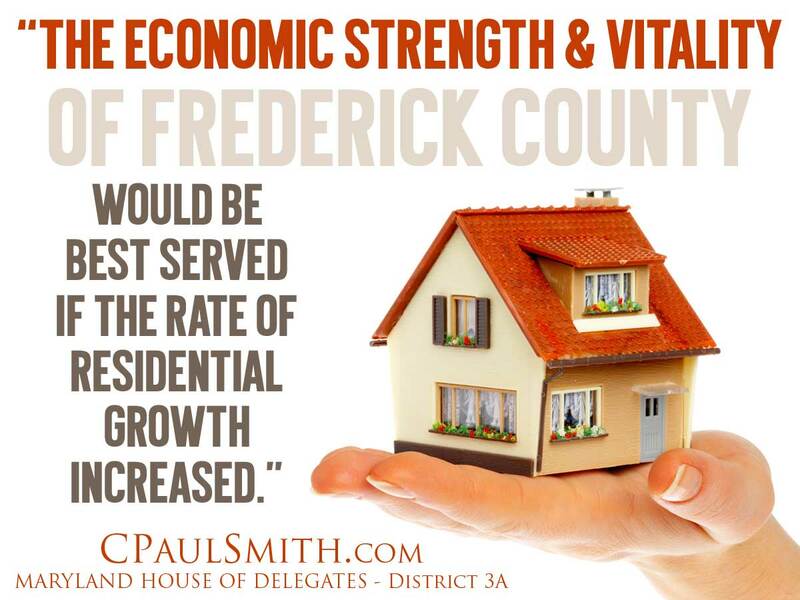 But what is the right amount of growth for Frederick County, considering property rights issues and the need for jobs? Without answering these questions, you really can’t say whether we’re having too much or too little growth. Opponents of the Young Board have not answered these questions. And without answering them, you cannot possibly have a rational discussion of the issue. Instead, all you will have will be a battle of assertions without reasons. When the Young Board took office, we pledged to help the local economy by bringing more jobs to the County, and we pledged to restore property rights that the Gardner Board had unfairly taken from hundreds of county residents. The Young Board has done what it promised to do, and there has been a big increase in county jobs. The net increase in county jobs during the current Board’s term is 3,015, as compared with a net loss of jobs during the term of the Gardner Board. The policies of the Young Board have admittedly helped increase residential and commercial growth in Frederick County. And these efforts to increase our growth rate from historic lows coincide with efforts to bring more jobs to the area and to reduce unemployment and foreclosures. The rate of new residential growth during the term of the Gardner Board (2006 – 2010) was the lowest rate (approximately 800 new permits/year) in several decades, and this slow rate corresponds with net job losses in the county of 3,232 over the last three years of the Gardner Board. Both of these were major factors in causing the highest unemployment and most foreclosures in the county in decades. Increasing the rate of residential growth is critical to help Frederick County. Our current growth rates (measured by new housing permits—1,005/year) are still far below the optimum level, and below what the Gardner Board agreed was an acceptable level (1,500/year). Here is an outline of the discussion points that support these opinions. If job growth were not critical to Frederick County, and if there was no need to restore property rights, then a NO GROWTH approach to planning might be feasible. 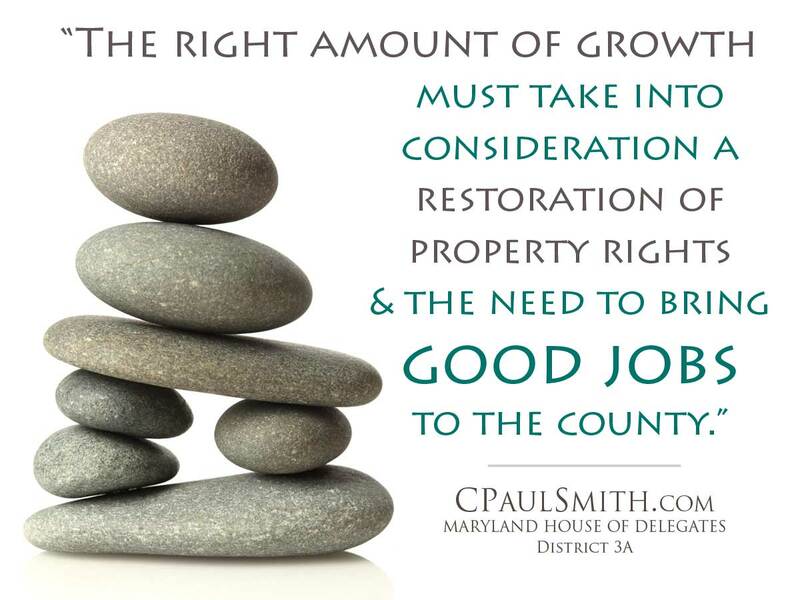 But such is not the case, and the right amount of growth must take into consideration a restoration of property rights and the need to bring good jobs to the county. These and other issues related to growth will be discussed in this section. Below is an outline of this presentation on county growth issues. What is the right amount of growth for Frederick County? The timing of the Gardner Board’s No Growth policies could not have been worse. The principal correction made by the Young Board was to revise the 2010 Comprehensive Plan. II. Is Frederick County Growing Too Fast? No. What is the optimum rate of residential growth? 80% of Frederick County land will remain open space. III. Conclusion—Frederick County is not growing too fast. A. What is the right amount of growth for Frederick County? For the No Growthers, any amount of development is too much. But most county residents acknowledge that we want job growth and that some residential growth is needed. But whatever that ideal rate of residential growth is, 1,500 new residents/year is not too much according to the Gardner Board (2010 Comprehensive Plan, at page 02-10). And the Young Board yearly average (888) is well below that. B. Gardner Board down-zonings. 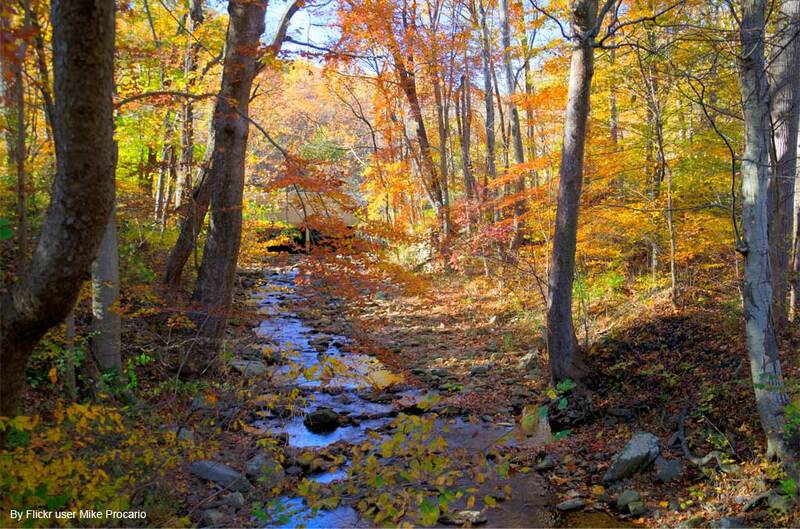 I like Frederick County’s wooded mountains, streams, parks, farm lands and open spaces that comprise approximately 80% of Frederick County. My goal is to retain this percentage of open space. What is at issue is the down-zoning of over 200 properties in the County by the Gardner Board, which would have rescinded 40-year-old land use plans, and in so doing would have increased the open spaces in the County from 80% to 81%. The Gardner Board’s assault on property rights was an egregious taking of 4,166 acres of property without paying compensation for it. This improper taking was an attempt to stop growth without consideration of the economic consequences it would bring; it was an act of taking millions of dollars of property value from hundreds of Frederick residents. The Young Board was voted in by a landslide to correct this terrible error, and we did. C. No Growth Policies of the Gardner Board hurt Frederick County. The majority of the Young BOCC campaigned on the promise to bring needed jobs to Frederick County and to reverse the draconian No Growth policies of the Gardner Board, which contributed to unemployment and foreclosures and which stifled new job growth in Frederick County. The Gardner No Growth Board took extreme and excessive measures to shut down future growth in hundreds of areas in the county that had been planned for growth for the past 40 years. This excessive action was primarily accomplished through the 2010 Comprehensive Plan, and it was aided by other actions of the Gardner Board. Suddenly, with the stroke of a pen, over 200 property owners were robbed of the right to use their properties as they had been planning. Millions of dollars of value was taken from these people by the Gardner Board without any compensation. These actions were legal, but they were unfair and oppressive. The Gardner Board also took other actions to take property rights from citizens. (1) They amended the County APFO to supersede any municipality APFO that was less restrictive; (2) they blocked the availability of future sewer service to areas in the north of the City of Frederick, in areas that for decades had been planned for residential and/or commercial growth and for water service; and (3) they cut back the future growth areas of all but one of the twelve municipalities in the county. D. The timing of the Gardner Board’s No Growth policies could not have been worse—they only exacerbated the effects of the 2008 recession. If the Gardner Board understood the factors affecting the local economy, they would not have passed such a repressive and constricting Comprehensive Plan in 2010. But undaunted by their No Growth vision for Frederick County, that’s what they did. They shut down job growth in Frederick. The largest municipalities in the County filed a law suit against the County, asking the courts to strike down the Gardner Board’s new APFO term that sought to override municipality APFOs. The Gardner Board cut back on the annual tax equity payments that they had traditionally shared with the municipalities. The Gardner Board went to war against the municipalities. The policies and actions of the Gardner Board were clearly excessive and repressive. In the 2010 election, Young, Smith, Shreve and Delauter were elected in a landslide victory with a mandate to correct the excesses of the Gardner Board. E. The principal correction made by the Young Board was to revise the 2010 Comprehensive Plan, in order to restore property rights and decades-old growth plans. This was accomplished by the fall of 2012. 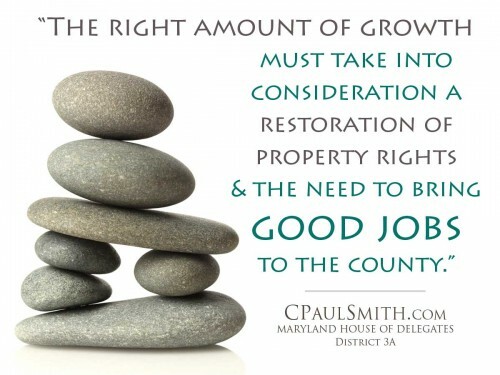 This revision put back into play most of the residential and business development plans for Frederick County, and these actions not only restored prior property rights, but these actions rejuvenated the county economy, including adding increased jobs and businesses to the county. The Young Board did what we said we would do, and it has been a tremendous boon to the economic strength of the County. But supporters of the Gardner Board don’t like it, and they have loudly and incessantly cried that this restoration is ruining Frederick County by bringing too much growth—that we are becoming another Montgomery County; they loudly complain that the county is now growing too fast. But they are wrong. Of course, any growth is too much for a No Growther. 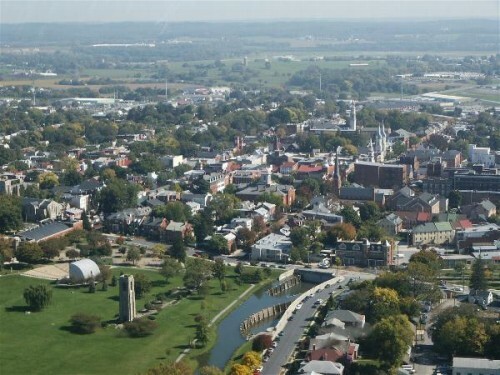 However, the fact is that the rate of new growth in Frederick County is still too slow—the County has not yet recovered to the ideal rate of growth, and the County growth rate has not even attained the growth rate that the Gardner Board predicted and endorsed in their 2010 Comprehensive Plan—i.e., a population increase of 93,500 people in the next 20 years, at a rate of at least 1,700 new residences per year. During the Young Board there has been an increase of 313 students in our public schools—there was a decrease of 79 students during the Gardner Board. But our schools continue to be under capacity. In fact, the County is not growing too fast, and we have not grown too fast during the last eight years. The County still needs more job growth and more business growth to operate at optimum economic efficiency. F. Correcting other repressive policies of the Gardner Board. Recognizing and applying these principles, the Young Board has abandoned the repressive policies of the Gardner Board and in their place established growth policies that will (a) attract more jobs, (b) allow residential growth where it would be best to occur, and (c) collect impact and development fees to pay for accompanying infrastructure. The Young Board has made improvements in each of these three areas. The rate of growth during the Young Board continues to be much lower than the optimum rate of growth for Frederick County. Opponents of the Young Board argue that too much new housing has been built in Frederick County. For the No Growthers even building one house is one house too many for them. But the great majority of residents acknowledge that a certain level of residential growth is good. Identifying an ideal rate of growth is difficult, but even the No Growth Gardner Board acknowledged that building 1,500 new homes a year would be an acceptable rate of residential growth. And despite the increased rate of new building permits that were issued during the Young Board, we are still far below that rate of growth. Frankly, the real beef that our opponents have is that by restoring the land use rights to the 200+ individuals whose rights were violated by the Gardner Board, the Young Board has put back into play 13,600 residences that were eliminated by the Gardner Board. These are planned, potential residences that can gradually be built over a 50-year period. Typically, not all of them will be built. And the rate at which they are built will depend upon the availability of jobs and financing—otherwise they will not be built. To illustrate this, note that during the past eight years, there has been approximately 20,000 homes in the “pipeline” for Frederick County. But despite this large number in the pipeline, the average number of new housing permits has been approximately 800 per year. This is the lowest rate for Frederick County in the last 30 years. This is not too fast a rate, nor is it too much growth. Whether there are 36,600 or 50,000 homes in the pipeline, it will continue to be the availability of jobs and financing that will dictate the rate of new housing permits. While the current population growth in Frederick County remains quite modest (and pales in comparison to the run-away growth in Montgomery County), it is true that the restoration of property rights and of the prior county growth plans has increased the number of potential homes to be built in Frederick County. In broad terms the number of homes in the “pipeline” will increase by 13,600 units. But the total build out of potential residences would occur over several decades. And even if this pipeline was totally built out (which never happens), it would add a projected 140,000 people in a 50 year period, which would give Frederick County a population of 400,000. This would still be less than half the population of Montgomery County. Such a build out would still leave 80% of the land in Frederick County as farm land, mountains, parks and open areas. Such a build out is possible under current zoning and land use plans, but IF it happens, and the rate at which development does occur is subject to job availability and financing availability—both of which continue to repress the rate of residential growth in Frederick County. Is there any correlation between the number of new residences in the pipeline and the number of new housing permits issued each year? No. The County has had approximately 20,000 residences in its pipeline for most of the last decade, but new housing starts have consistently been way below the pipeline amounts—1,400/year for the 10 years prior to the Gardner Board, and approximately 800/year during the Gardner and Young Boards. Despite an inventory of 20,000 residences in the pipeline, new housing permits have dropped to record lows in the past eight years. The number of residences in the pipeline—whether it is 20,000 or 50,000 does not affect the rate of new housing starts. The factors that determine the rate of new housing starts are the availability of jobs and financing. Those factors continue to constrain growth in Frederick County. G. Jobs. Every state, city and community around the nation recognizes that increased job growth is critical to their economic stability. Texas Governor Rick Perry goes around the country urging people to move to Texas, to take advantage of their good job markets. Almost every state and community seeks to attract the newest and best jobs in order to obtain and sustain a high quality of life for its residents. Many states in America have been greatly harmed by the loss of jobs and businesses. The State of Maryland has weathered the recent recession better than most states because of the presence here of federal government jobs and government-related jobs. This federal presence has been so powerful that Maryland has often been immune from some of the economic pressures that impair other communities in America. But the 2008 recession still caused thousands of people to lose jobs in Frederick County, which in turn caused thousands of foreclosures in the county. Strengthening the private job base in Frederick County was the most important thing we could do to help the County pull itself out of the recession. And it was through the County’s Business Friendly, Job Growth policies that Frederick County has recovered and been strengthened. During the term of the Young Board, we have brought thousands of new jobs to the County, with a net job growth of 3,015 new jobs. This job growth has been critical to improving our unemployment rate and reducing the number of foreclosures. But this job growth has necessarily included some residential growth. The Young Board has done many things to promote future increases in job growth. This includes moving forward with the development of Jefferson Tech Park (a development that the Gardner Board initially supported), some development on Route 85 corridor and some in Urbana. All of these bring a residential component with them, which is a component of smart growth, in that it provides housing close to jobs. G1. Capitalizing on regional growth. Most people acknowledge that a certain amount of consistent residential growth is good for the County—especially when there is residential growth occurring in all of the counties around us. Even if Frederick County were to stop growth here, the growth around us would still cause us traffic congestion and wear and tear of our roads by the residents of other counties who would not bring in any tax revenues to help upgrade our infrastructure. The best approach is to use regional forces for growth to our advantage—plan for some residential growth in areas that would be best for the County, and then put in place appropriate impact and development fees so that the growth will pay for itself. G2. 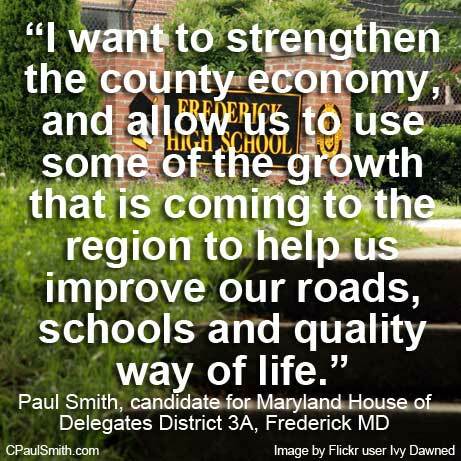 Frederick County needs job growth. Another critical aspect of growth is that of bringing good jobs to Frederick. Currently, about 40% of Frederick residents commute outside of Frederick to their jobs. Bringing new jobs to the county will take some cars off the road and will strengthen the economy here; it will help insulate us against future recessions. When the economy retracts, everyone comes to recognize that a strong and diverse job base it critical to avoid unemployment and foreclosures. With these factors in mind, Frederick County needs to attract private businesses to establish themselves here. With Ft. Detrick and the National Cancer Institute and other associated businesses, there is already a strong federal employment force here. We need to add new private jobs to our mix to strengthen our local economy against future economic downturns. While attracting jobs is my number one objective, there is necessarily some residential growth that will accompany the job growth. And some residential growth will take place even apart from job growth. Some residential growth is fine if it pays for its share of the infrastructure (roads, schools, water & sewer, fire & rescue, libraries and environmental protection) that it necessitates. It should be noted that at the beginning of the Gardner Board’s term, improving Route 75 was a high priority on the County plans. But the Gardner Board gradually lowered this as a priority item, and then eventually removed it altogether as a funding priority for them. When they approved the 2010 Comprehensive Plan, they were no longer seeking to improve Route 75. The Gardner Board also removed from its plan a number of road improvements, including by-pass plans for Libertytown and New Market. The Gardner Board’s rationale for eliminating road improvements was the antithesis of sound planning—they rationalized that if we don’t have the funding the build the roads now, then we shouldn’t put a proposed road on our plans. This makes a lot of sense to people who want to stop growth, but it makes no sense to people who are trying to make intelligent plans for some future growth. When the Young Board completed its revision of the 2010 Comprehensive Plan, we put back some of those omitted road improvements as well as added a few new ones. The Gardner Board’s 2010 Comprehensive Plan contained many parts that were intended to stop and hinder growth; the plan was excessive and punitive and damaging to the economic growth and vitality of Frederick County. II. Is Frederick Growing Too Fast? No. Residential growth in the county continues to be much lower than the optimum level, and it is lower than the rate that the Gardner Board endorsed as a proper and acceptable rate of growth. It is not true to say that the Young Board has caused too much growth. The best argument that the No Growthers can make is that the Young Board has caused too many potential housing units to exist in the pipeline for future growth. But that is not true either. The number of units in the pipeline does not affect the rate of growth; and the rate of growth continues to be well below a pace that would be too fast for the County. Even if all the units that are projected to be in the pipeline are built, that would not take place for over 50 years; and the new impact fees and DRRA obligations, and continuing APFO limitations can make sure that new residential growth does not outpace infrastructure growth. Assertions that Frederick County is growing too fast are false. At best, they are based upon unfounded speculation that increasing the size of the pipeline will cause the growth rate to be too fast. But there is no such correlation. We are not growing too fast. A. What is the optimum rate of residential growth? What rate of growth would be too fast? 1,500 new permits/year? 2,000? 2,500? And what rate of growth is not fast enough? For the Monrovia No Growthers, even one new permit a year would be too fast. But they have not demonstrated that they either understand or care about the big picture for the entire county. The Monrovia No Growthers contend that any new growth is too fast because Route 75 is already unacceptable. Since they have jobs, they really don’t care about whether any other jobs come to Frederick County. The optimal rate of residential growth would be a steady rate that our local building industry could rely on, and it would entail residential growth that paid for the infrastructure needed to keep pace with it. The optimum rate will not have a number assigned to it; the optimal rate can be identified by the job growth that accompanies it, as well as by a qualitative assessment of whether infrastructure keeps pace with growth. B. 80% of Frederick County land will remain open space. Our Board restored the previous land use plans that county residents had been relying on for 40 years. But the amount of acreage that our Board restored was still smaller than the growth areas that existed prior to the 2010 Comp Plan. This Board has not increased the net growth plans for the County beyond what they had been for 40 years. And this Board is not proposing further expansion of development. This Board likes the fact that 80% of Frederick County is in woodland, farms, parks, streams and open areas. We intend to keep it that way. But it was the fanaticism of the No Growth Gardner Board that had to be corrected because it was unfair to citizens and because it was hurting growth at a time when the County needed growth. To the extent that our opponents may attempt to portray us otherwise, they are misrepresenting us. C. Housing units in the pipeline. At the time the Gardner Board approved the 2010 Comp Plan, there were 17,550 lots in its “pipeline.” The “pipeline” is the number of future, planned residential units that have received some level of approval. The Gardner Board projected that there would need to be over 36,600 housing units to accommodate the population growth that they projected (93,500 people). This equates to an additional 19,050 units needed in the pipeline. The additional, potential development that will be allowed by virtue of restoring the 200+ down-zonings will be approximately 13,600 units. However, the number of units in the pipeline has never determined the number of new housing permits issued each year. The only remaining legitimate growth question is whether the increase of projected new dwelling units from 36,600 to 50,000 will be too much growth for Frederick County in the future. No. And this is why. Even if all 50,000 potential residents are ultimately built, this is projected to bring a population growth of approximately 140,000 people. And at the current rate of growth it would take 57 years to do this. This is a much slower rate than projected by the regional planners. Regional planners project that Frederick County population will grow at approximately twice this rate over the next 20 years. The new residences that will be added will be added gradually—over the next 50 years. Frederick population is projected to grow by almost 90,000 during the next 20 years, and that would leave a growth of 50,000 people for the 30 years after that. If all this growth were to occur, it would bring the Frederick County population to 400,000. There will not be additional residential growth in the County unless the County Government expands the growth areas. This growth would be about 1/3 of the density of Montgomery County—nothing close to the character and appearance of Montgomery County. Thus, even if there was a total build out of the potential number of units, it would take place over several decades, and it would still leave intact the mountain woodlands, parks, streams, farms and open areas that comprise 80% of Frederick County. Such development would be moderate increases in the county population that would accompany some needed job growth. All of this would strengthen the county economy, and allow us to use some of the growth that is coming to the region to help us improve our roads, schools and quality way of life. The number of units in the pipeline will not increase the rate of growth, but it will change where some of the new residential growth occurs, and it will delay the build out of many of the developments. In other words, if jobs and financing control the rate of residential growth, the existence of more places to build homes will result in homes being built in the areas where consumers would most want to live, and therefore some of the existing, approved developments will not develop as soon, and the time for all of these residential developments to be finished will be delayed, because the supply (the number of possible new residences) has increased. This delay will also bring with it increased financial risk for developers, because if the supply exceeds demand they run the risk of dealing with a sparse market that does not demand the number of homes that the developer would like to sell. D. New Housing Permits Issued. Even though there were 17,550 units in the pipeline at the end of the Gardner Board, the number of new housing permits issued during the four years of the Gardner Board is the lowest number since the 1960s. The average number of new housing permits was 771/year during the Gardner Board. This is approximately half of the average number during the ten years before the Gardner Board (e.g., 1,430/year). This is also one-half the number that the Gardner Board’s Comprehensive Plan projected and indicated to be acceptable (1,500 — at p. 02-10). The Young Board was successful in raising that number a little bit (to 1,005 /year), but this rate continues to be far below the rate that even the Gardner Board acknowledged to be good and acceptable. There were 1,238 permits issued in 2013, and the number is on pace to reach 1,357 in 2014. But these numbers are still below the rate that the Gardner Board approved—1,500 per year. E. Impact and Other Development Fees. One final question is whether the actions of the Young Board will cause the rate of development to happen too rapidly? The answer to this is also, No. While the Young Board is restoring residential growth in areas that were removed by the Gardner Board, the Young Board maintained impact fees and put in place school mitigation fees and other financial requirements on developers, to make sure that what development does occur is attended by infrastructure improvements. This will insure that development pays for the infrastructure improvements that it causes, and that infrastructure improvements keep pace with new development, and that new development does not burden existing taxpayers. Another thing the Young Board did to prevent overgrowth problems is to increase developer payments in consideration of extending the time periods in which developers can move forward with their projects. These payments and commitments are secured through Developer Rights and Responsibilities Agreements (DRRAs). Such agreements have been available under Maryland law for about twenty years, but until the Young Board, Frederick County had not utilized them to make sure that new development does not outpace infrastructure growth. The MTC DRRA is an example of one of the most exacting and expensive DRRAs ever made. Its terms are so rigorous and exacting that it puts significant risk on the MTC developers, and it provides substantial protection for Frederick County and its residents that needed infrastructure will keep pace with that development. Will the development approved by the Young Board outpace the development of roads, schools and other infrastructure? No. Impact fees, other developer requirements and the APFO will continue to prevent development from getting ahead of needed infrastructure improvements. In light of this, it is totally false to state that Frederick County is growing too fast under the Young Board. The No Growth Gardner Board ushered in a period of anemic growth in Frederick County, during which unemployment and foreclosures increased as the County lost jobs. The Young Board has helped to correct this problem; it has improved job growth in Frederick County, and there has been a modest increase in residential growth. It is the Young Board’s business-friendly policies and its job growth and targeted residential growth policies that have greatly contributed to the recovery. No Growthers complain that the actions of the Young Board will bring too much growth in the future because we restored land use rights that will reinstate the planning for 13,600 additional residential units in the county. While this is more growth than the Gardner Board would have allowed, it is growth that will occur over four or five decades; it is growth that has been planned for forty years; and it will still leave 80% of Frederick County in mountains, forests, parks, streams, farms and open spaces. The Young Board has put in place the impact fees and other development requirements so that when this development does occur, it will not outpace the infrastructure nor impose the tax burdens on existing residents. The economic strength and vitality of Frederick County would be best served if the rate of residential growth increased to 1,500 new homes per year.